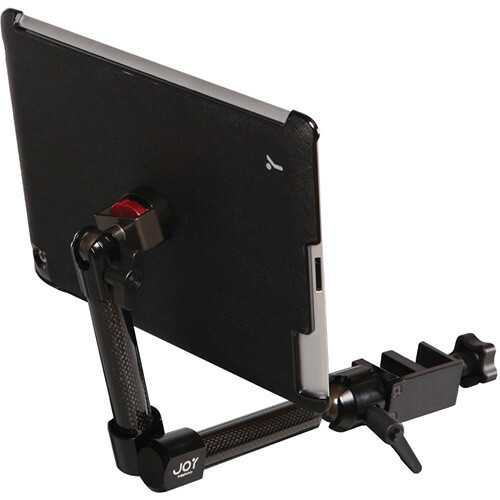 Raises Tablet up to 13"
The Joy Factory pairs their aXtion Bold M-Series Case with their MagConnect Carbon Fiber Wheelchair Mount to allow you to securely mount your iPad 4th, 3rd, & 2nd Generation to a wheelchair for comfortable use. The mount can raise your iPad up 13" and swivels 360°. When set up, the hard-shell iPad case connects to a lightweight carbon fiber arm that connects with a joint to another carbon fiber arm which then connects to the clamp. The mount connects to the wheelchair's tubing or to a flat surface via the clamping base. To easily position the iPad, the mount relies upon a MagConnect connector and a spherical joint on the case and base as well as a 360° joint between the two arms. The connectors use powerful magnets to interlock the hard-shell case with the mount's arm. The spherical joints swivel 360° and move in two planes at once so you can easily adjust the position and viewing angle of your device from portrait to landscape or anywhere in between. With the iPad removed, the arms of the mount fold together for easy stowage. The aXtion Bold M-Series Case is made of silicone and is compatible with the iPad 4th, 3rd, & 2nd Generation. The cover offers a screen protector which allows for touchscreen response while keeping your screen protected from scratches. The tear-proof port and button covers are molded into the case and provide added protection without preventing the buttons from working. Each corner of the case is extra thick to guard against additional bumps. The corners also feature ports for an optional shoulder strap. The case is shockproof and can withstand a drop of about 6'. When not mounted, your iPad can safely be carried without removing it from the shell. The MagConnect hard-shell case comes with a low-profile cap to cover the magnetic connector. Box Dimensions (LxWxH) 12.756 x 8.347 x 4.095"